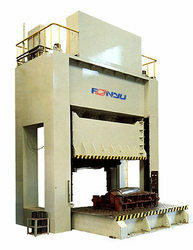 With our in-depth knowledge and experience of this industry, we are engaged in manufacturing an excellent quality range of Automatic Hydraulic Press. Owing to our in-depth industry experience and precise knowledge of this domain, we are offering an outstanding assortment of Industrial Hydraulic Press. Backed by rich industry experience and domain expertise, we are involved in manufacturing and supplying qualitative range of Hydraulic Notching Presses. Leading Manufacturers & Exporters of Power Presses, Cross Shaft Press, Shearing machines, Press Brakes, Hydraulic Presses, Roll Forming Machines, Decoilers, Feeders, Straightner, cut to length lines & S.P.M Machines.